This Museo Mundial installation was implemented in the Natural History Museum in Nuremberg and it focuses on the problem of overfishing and food security in the Coral Triangle (close to Papua New Guinea). Tuna in particular, which is traditionally fished by the inhabitants of Oceania, is nowadays one of the most endangered species due to international fishing companies hunting tuna in large quantities. This also affects the food security of those people living there. 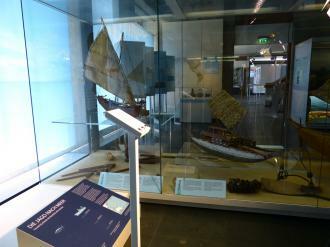 The installation is located next to a traditional Pacific Ocean fishing boat. This installation catches the eye of the visitor by visually showing (over a period of 60 years) the decreasing number of tuna fish and the procedures employed by the global fishing industry. It uses a fishing guide to teach the visitor about sustainable ways of fishing and show alternatives to consuming overfished species like tuna. 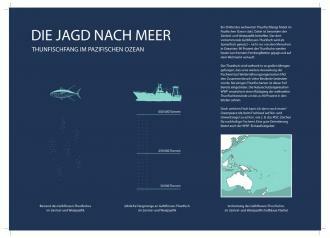 The installation provides information on the issue of food security and overfishing by visually presenting various aspects. 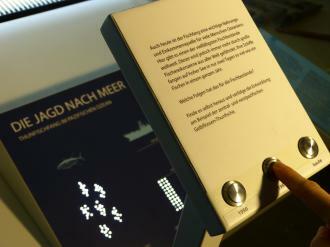 A light installation invites the visitor to touch the key buttons. Each button displays a certain year between 1950 and today. With each year the number of tuna fish decreases and the number of fish catches increase. In the period between 1950 and today the tuna fish stock in this area decreased by two-thirds and the fishing numbers increased twentyfold. This is visualized by decreasing and increasing numbers of small lights on a wooden plate. Through this visual approach visitors can understand the correlation between the decrease in tuna in the Pacific Ocean and the practices of the global fishing industry. "One-third of tuna fishing worldwide is taking place in the Pacific Ocean. A hotspot is the Central and Western Pacific region. The domestic yellow tuna is a food fish but not only for the population of Oceania: 90% of the tunas are fished by international trawlers and sold on the world market. Tuna is caught is such high numbers that increasing catches still further would lead to a collapse in many tuna stocks. The stocks of some tuna species have already collapsed. The World Wildlife Fund refers to a 90% decrease over the last few years. Fish are an important food resource for many people in Oceania. Oceania has one of the biggest fish stocks in the world. But one single trawler catches the same amount of fish that a small-scale fisher catches in one year. This is a danger to both food security and biodiversity. But what can be done about it? Greenpeace recommends the use of the Marine Stewardship Council (MSC) Certificate. The WWF also provides good advice in the form of its Seafood (shopping) Guide." Visitors can also take away a leaflet on the MSC guide to the sustainable consumption of fish food, which also includes a link to a mobile phone app. In this way, the visitor gets to know where to buy fish that are not endangered. Consequently, this tool sheds light mainly on Millennium Development Goal (MDG) 7 ("Ensure environmental sustainability"). In particular, it focuses on target 7A that aims at "reversing loss of environmental resources" and 7B that aims to "reduce biodiversity loss". Other MDGs touched on by this topic are MDG 1 ("Eradicate extreme poverty and hunger") and MDG 8 ("Develop a global partnership for development"). When addressing the topic of overfishing in a museum, certain types of museums and exhibitions are more suitable than others. Types of objects that could be connected to this development topic include boats and ships, fishing nets and other objects used for fishing, and cultural objects related to fishing and oceans. In addition, other hunting tools could also provide a starting point for exploring the topic of fishing. It can be interesting for the visitor to compare modern and traditional hunting tools, to show how the increasing efficiency of hunting is contributing towards the endangerment of certain species. In our case, the big industrial fishing trawlers are in stark contrast to the traditional fishing boats used by indigenous populations. Biodiversity in developing countries is a topic that will remain far removed from the museum visitor unless it is not linked to his/her everyday life. Therefore, it is necessary to find connections between the issue and people in Europe. For example, we provided additional information on how much tuna is being exported and sold in industrialized countries like Germany. Given the limited attention span of each museum visitor, it is important to present only the most important aspects of the issue, such as the impact on a certain group’s food security, the decrease in a certain fish species, the development of the fishing industry in a specific area, fishing quotas, among other possible aspects. The use of a light installation involves some restrictions that need to be considered before assigning work to electricians, carpenters and designers. You will need to find a place in the museum without direct sunlight. Otherwise, the installation’s lights will not be seen clearly. You also need to have sockets nearby to supply electricity. In addition, if you plan to place electronic equipment inside glass showcases, you need to find a solution to the issue of cooling in advance. For this reason, we used LEDs to minimize the amount of heat generated within our installation. The question of how to fix the installation in the museum has an influence on the type of construction used. For example, in our case, we could not fix the installation to the ground, which is why we let the carpenter construct a metal grounding plate to attach the installation to. This provided a stable base for the installation. For the kind of installation that we are describing here, you will need four types of subcontractors: a carpenter to construct a wooden case for the technical equipment, an electrician to install the lights and connect them to the buttons, a designer for the pictures and texts on the wooden case, and a print company to print foils from the designs for attaching to the wooden case. The cost of a light installation depends very much on what kind of features it has. For example, a greater number of buttons for visitors to press will increase the complexity and thus the price of the light installation. The more lights you want in your installation the more projectors you will need and the higher your costs will be. Lights are illuminated by projectors and these are expensive. Therefore, a clear understanding of what is necessary will make the budget estimates more realistic. In our case, we finally used 5 projectors with 33 lights each adding up to a total of 165 lights. These lights indicate tuna fishes and fishing trawlers. We used only white lights and just three buttons to reduce the price but also because we wanted to keep it simple for visitors to use. We incorporated core facts into texts to give an introduction to the topic (see Details section). As there are several subcontractors involved in producing the installation, you should ensure that you carefully coordinate the subcontractors, so that the different parts of the process fit together smoothly. For example, the carpenter needs to deliver a case matching the specifications required by the electrician, while the designers need to know exactly where the lights will be placed and, consequently, how to build a design around the lights, and where exactly the design fits into the overall installation. An electrical installation is heavy and bulky, and therefore expensive to transport. It is of paramount importance therefore to check that all elements function before it is transported to the museum. Finalize everything. Once you give the "go-ahead", the final product will be transported to the museum. It will then have to be attached to the museum’s power system and fixed to its location on the ground in a stable manner. Some final work may still be necessary once it is installed in the museum. For example, for our light installation, a final task that was completed in the museum was sealing the blue cover plate with clear varnish to prevent it from becoming stained over time. Most people eat fish from time to time. For this reason, the topic of overfishing can easily be related to the daily life of museum visitors. This makes for a very personal and direct engagement with the development topic. A light installation is a very eye-catching educational tool. Everyone is curious about pushing the buttons and seeing what happens. So, it is easy to grab the attention of both adults and children through this installation. The interactive element lets people explore and understand for themselves the connection between the fishing industry and endangered fish stocks. This method encourages self-guided learning. The budget needed for this kind of installation is relatively high. It is more complex to develop and visualize than a non-electrical installation that only involves prints. If you want to make a point, show it graphically. We received a lot of positive feedback from the visitors, who particularly liked the concrete advice on how to act for themselves, for example by using the Seafood (shopping) Guide. There were visitors who stated that they will now start to consume only MSC certified fish. Some visitors reported that the lights are too bright and are therefore difficult to see.